Beautiful specimen stock certificate from the Lubrizol Corporation printed in 1971. This historic document was printed by the American Bank Note Company and has an ornate border around it with a vignette of an allegorical man and woman. This item has the printed signatures of the Company’s President, and Secretary, and is over 41 years old. Warren Buffett's leading heir apparent at Berkshire Hathaway, David Sokol, resigned after buying shares in Lubrizol Corp LZ.N, a chemical company he then pushed Buffett to acquire. The Lubrizol Corporation, a Berkshire Hathaway company, is a specialty chemical company that produces and supplies technologies, which are designed to improve the quality and performance of products in the global transportation, industrial and consumer markets. Headquartered in Wickliffe, Ohio, United States, Lubrizol holds a base of approximately 1,600 patents as of October 2011. Lubrizol operates production facilities in 19 countries, with sales and technical offices throughout the world, through the efforts of more than 6,900 individuals. Lubrizol sells more than 12,000 products in over 100 countries. The company has two major business segments: Lubrizol Additives (LZA), a leading global supplier of fuel and lubricant additives for transportation and industrial applications; and Lubrizol Advanced Materials (LZAM), a leading global producer of advanced specialty polymers, polymer-based additives and chemical additives for a broad range of consumer and industrial applications. The Lubrizol Corporation is on Fortune magazine’s list of the 500 largest companies in the U.S. Based on 2010 revenues, Lubrizol moved up in the ranking order to 423 from 453 the previous year. On the basis of 2010 profitability metrics, total shareholder return (TSR) and earnings per share growth, Lubrizol was the top performing company among the 16 chemical companies that are on the Fortune 500. Lubrizol also moved up in the ranking order in the Forbes magazine’s Global 2000 to 1,220 from 1,249 the previous year. The company ranked number 20 globally in their industry sector of specialty chemicals. Unlike the Fortune 500, which is a ranking solely on 2010 revenues, the Forbes Global 2000 ranking is based on a combination of revenues, net income, assets and market value. Lubrizol originated on July 31, 1928 as The Graphite Oil Products Company in Ohio, United States. The company was founded by Kent Smith (first President), F. Alex Nason (first Vice-President), Frank A. Nason (first Treasurer), Kelvin Smith (President in 1951), Vincent Smith (first Secretary) and Tommy James (introduced Lubrizol’s first gasoline additive). 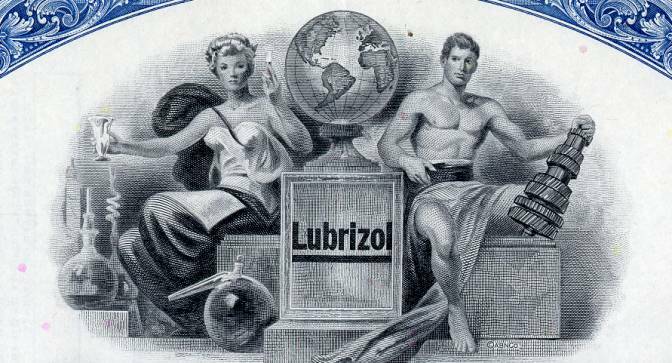 On September 10, 1929, Lubrizol’s first product, a graphited lubricant and applicator marketed under the Lubri-Graph name, was launched. The young company changes its name to The Lubri-Graph Corporation. 'In 1931,' The Lubri-Graph Corporation moves to the Cleveland suburb of Wickliffe, Ohio. The location will become the company’s corporate headquarters and remains so today. By 1934, sales of Lubri-Zol special motor lubricant begin to soar; the company changes its name yet again, becoming The Lubri-Zol Corporation. (The hyphen is dropped in the 1940s.) Lubri-Zol also establishes Anglamol, Ltd.—later Lubrizol Great Britain, Ltd.—its first affiliate outside the United States and the beginning of its expansion as a global enterprise. Zinc dithiophosphate, Lubri-Zol’s pioneering oxidation and corrosion-inhibiting lubricant additive chemistry is introduced to the market. In the 1940s, Lubrizol supports the war effort. Government authorities credit Lubrizol with producing more than half of all the engine oil additives and about 80% of all the gear lubricant additives required in Allied military operations. During this time period, Lubrizol researchers develop and introduce the first multipurpose extreme pressure additive for hypoid gears, along with the first fluid additives for automatic transmissions. By the 1950s, Lubrizol becomes the first company to manufacture lubricant additives in France. In 1957, Lubrizol acquired International Rustproof Corporation, a producer of metal coatings. Lubrizol gained significant technical expertise in coatings technology—expertise that will increase over the years through numerous research and development initiatives. 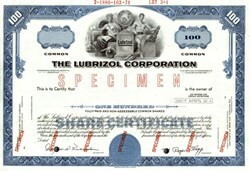 On August 22, 1966, Lubrizol goes public, with stock offered on the New York Stock Exchange (NYSE: LZ). Growing concerns about air quality and increasing demand for improved engine performance, lead Lubrizol to re-energize its efforts in fuel additives. As a result, new, multifunctional dispersant gasoline additives are introduced to the marketplace. Before the 1970s, no one thought about fuel economy. That changed with the gas crisis of 1974. Lines at gasoline stations stretched for blocks, and for the first time, Lubrizol turned its attention to additives to improve total vehicle economy. Lubrizol also introduced super high performance diesel oil additives and fuel saving multigrade gear oil additives. The 1980s are a decade of technology firsts for Lubrizol. Innovative new additive chemistries are introduced in numerous product areas: passenger motor oils, gear oils, hydraulic fluids and viscosity modifiers. Lubrizol launched high water content fluid microemulsions for use in hydraulics. In the 1990s, Lubrizol builds on its long-time presence in Asia Pacific by focusing its efforts in China. The company begins to supply lubricant additives in China through its joint venture facilities in Tianjin and Lanzhou. Lubrizol continues to expand its presence in the specialty chemical marketplace by making significant acquisitions in the areas of performance coatings and metalworking. In addition, in 1996, the company acquired CPI Engineering Services, Inc., a formulator of specialty synthetic lubricants used in air and refrigeration compressors. On June 3, 2004, Lubrizol completed the acquisition of Noveon International, Inc.(formerly BF Goodrich Performance Materials), a specialty chemical company with a strong product portfolio in additives and ingredients for the personal care, performance coatings and engineered polymers markets. Noveon was a transformational acquisition that nearly doubled the size of the company and cemented Lubrizol’s position as a global specialty chemical company. In 2009, Lubrizol overcame the difficulties of the global economic recession to become one of the few chemical companies to produce record earnings. The results from 2009 contributed to Lubrizol being named Company of the Year by Chemical & Engineering News in January 2010. Later in 2010, Lubrizol expanded its global footprint by breaking ground on a new additive manufacturing plant in Zhuhai Gaolan, China. On March 14, 2011, Berkshire Hathaway Inc. (NYSE: BRK.A, BRK.B) and The Lubrizol Corporation (NYSE: LZ) announced a definitive agreement for Berkshire Hathaway to acquire 100% of outstanding Lubrizol shares for $135 per share in an all-cash transaction. The transaction, which was unanimously approved by the board of directors of each company, is valued at approximately $9.7 billion, making it one of the largest acquisitions in Berkshire Hathaway history. This transaction was approved by Lubrizol’s shareholders on June 9, 2011. The deal is expected to be finalized in the third quarter of 2011. On September 16, 2011, Berkshire Hathaway completed the acquisition of Lubrizol.